Blue cows? Well, yes. 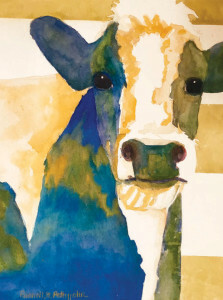 When most of us look at cows, we see blacks, greys and browns, but in Purnell Pettyjohn’s world, she perceives blues—and purples and yellows even. Her watercolors make blue cows, make sense. Purnell’s colorful cows are charming and inquisitive as they poke their noses through fence rails, or relax happily in sunlit fields, or nestle with their baby blue calves close-by. She draws us into that vivid place we call Purnell’s world. The blue cows are only the most readily identified of her images, the ones most popular with buyers of her paintings and of her less expensive giclee prints—very fine reproductions that are hard to distinguish from the originals. She calls herself a colorist and is celebrated for her watercolors, saturated with color often unexpected and utterly original. Whether animating a range of animals (this writer loves her goats even more than her cows), landscapes, townscapes, still lifes, flowers, or scenes animated with people, her colors glow with strong hues in a range of skillfully graded light and dark tones. 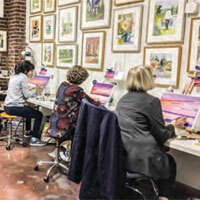 As a nationally recognized artist, she is a member of the American Watercolor Society and a Signature Member of the Virginia Watercolor Society. Purnell is the mother of three grown daughters who adore her, as do her fifteen grandchildren. She finds time to sing alto in her church choir and takes on her share of volunteer work. Though Purnell turned her energy to art as a professional only after she’d had children, she’d been a self-described doodler throughout her childhood in Martinsville. In high school, an overly stern art teacher almost quashed her talent and desire, but in college, she persevered as a double major in art and secondary education. Soon after graduation in 1972 and newly married, she’d just won a job teaching art at E.C. Glass High School when she learned that she was pregnant. In those days, impending motherhood forced teachers to give up their positions; in retrospect, that was a sad day for the young artists she might have nurtured there. It was not until 1991, when Purnell accepted the invitation of her good friend, the late Katie Vaden, to attend a week-long workshop taught by Judi Betts in Cumberland, Maryland. It was there that she focused on painting and began to take her work seriously. Purnell credits Betts with teaching her to apply washes, with stimulating her excitement about the medium. The lucky happenstance of her first, unexpected sale gave her an extra push to paint. That piece’s subject was the door of a house; while she was painting it, its owner opened that door, took a look at the painting on her easel and offered to buy it on the spot. That transaction gave her a bolstering boost to her confidence. Skip Lawrence was Purnell’s and Katie’s favorite teacher, the one from whom they learned the most. “I loved his fresh, transparent watercolors,” she reflects. “Lawrence’s book is my watercolor bible.” (William B. Lawrence, Painting Light and Shadow in Watercolor, 1994). “Skip taught me to ‘charge’ color,” that is, to create a new color by putting one hue on the paper, then, while it’s still wet, introducing over that base color, a second one, essentially mixing the colors on the paper, not the palette. “I adore watercolors.” Purnell’s adoration is blazingly apparent even when she teaches the most elementary techniques to a clutch of beginners, of which the writer was one, just last year. She can burst into giggles of surprise and amazement as she shows how colors can move into one another, then warns her students, “You can muck it up fast—it’s not as spontaneous as it looks.” Her enthusiasm is contagious; her classes are a delight. “My goal as a teacher is ‘growing’ artists,” she says. “I got lucky when other painters—locally and in those workshops— welcomed me with open arms. I was thrilled when people would buy what I loved to do.” Annie Massie was particularly inspiring. Purnell says, “She was the dearest cheerleader for us beginners.” Acceptance in juried exhibitions where she soon garnered awards was pretty thrilling as well. Purnell’s courses follow logical order: basic techniques for putting watercolors on paper come first, with subjects she assigns. But soon students choose their own subjects, ones appropriate to successively more difficult assignments. She is a great booster of her students, but also a perceptive and helpful critic. As a student of Purnell, this writer finds her demonstrations of techniques engrossing and entertaining. Working quickly, she makes it look easy. “Get in and get out fast,” she advises. Exuberance and energy mark her work. Her students find it hard to stop watching her paint and turn to their own efforts in her Tuesday afternoon class. When this group gathered for the first time in Purnell’s cozy, top-floor studio downtown, none had ever met. The small band of enthusiastic beginners varied in age, background, gender, neighborhood. Now, a couple of years later, the group is bonded and close; the paintings created by these pupils are so varied, one would not guess they come from the same class. There are never more than eight pupils gathered in her cheerful and airy, sun-bathed studio, perched atop The Art Box, a locally-owned art supply shop where local artists rent studios large and small, at the corner of 12th and Grace Streets in downtown Lynchburg. Purnell’s enthusiasms overflow in her own house and home studio. Every wall is covered—with paintings bought or traded with teachers and fellow artists, with her own work, with that of her students. Her framing studio is light, bright and efficiently designed. The piece de resistance is a massive mat cutter, mounted on a large table at the perfect working height for Purnell. 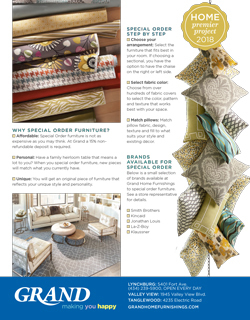 She cleverly had it installed on a heavy-duty piano hinge that, when lowered and covered with fresh holiday linen, does double duty as a dining table for large and lively gatherings of her children and grandchildren.